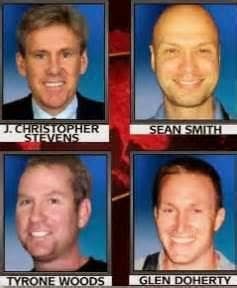 What has really been frustrating and sad is the continuing deception and cover-up of the truth about the Benghazi terrorist attack on September 11, 2012, which resulted in the deaths of Ambassador Christopher Stevens, along with Ty Woods, Sean Smith and Glen Dogherty. It is bad enough the cover-up by this president and administration of what really happened in Benghazi and even worse that the main stream media has been participating in providing cover for this administration, but I cannot understand why John Boehner isn't willing to establish a select committee with subpoena power to try and get to the bottom of the scandal. For the families of those for great Americans, and for their memories, and for the American people, we need to find out the truth about what did the president know and when did he know it; and also find out why were the Ambassador and the compound left with such little security, security that they had begged for; and also find out why not every attempt possible was made to save the Ambassador and his men. Now that the "smoking gun" e-mail from the then, White House Deputy Strategic Communications Adviser Ben Rhodes, [from e-mails obtained in a "freedom of information" lawsuit won by Judicial Watch] has been revealed that shows that the Susan Rice deceptive talking points have come right out of the White House, I am begging the Speaker of the House John Boehner to finally do what he should have done many, many months ago and establish a select committee. Or maybe, Speaker Boehner, you are too busy in mocking your fellow Republicans, especially those more conservative Republicans that obviously disturb you. Well you whiny small man it is about time you take your job seriously as Speaker and finally do what is right. Establish a select committee on Benghazi, NOW! Or Speaker Boehner maybe it is you the one who should be mocked: "Oh, don't make me call for a select committee. Oh, this is too hard. Oh, I just want to cry." If you can't or aren't willing to do your job Speaker Boehner [and it makes me sick to say those words] then I say, leave the speaker-ship and get the hell out of congress because you will have deemed yourself to be useless to the interests of the people of the United States. UPDATE: breaking news 10:00 am from Catherine Herridge of the Fox News Channel. She has learned that Speaker Boehner has decided to call for a select committee on the Benghazi terrorist attack on Sept. 11, 2012 and it could be named later today or early next week. She said Speaker Boehner said that he was waiting all this time for some credible evidence that this scandal led to the White House before he would call for the select committee. The e-mails Judicial Watch that have just been released have provided that credible evidence. Hallellujah! Thank you Speaker Boehner. Tales now officially withdraws its hope of your defeat as congressman, as while late, you ended up doing the right thing.